Many people mistakenly believe that cold refrigerated air escapes from the display case. Instead, ambient heat is actually drawn toward and disperses colder air, which causes an imbalance in the display case temperature inside. As more warm air rushes into the display case, this causes the temperature of stocked merchandise to warm up. The refrigeration and compressor system are now forced to work harder and more frequently to cool that air and to lower and stabilize cooler temperatures. It's not just heat that affects stocked merchandise in a refrigerated case. The infiltration of ambient light into the refrigeration cooler also causes variations in temperature and product appearance which is especially noticeable between the items merchandised at the front and those at the back of the display shelves. Most consumers can see the difference in food products at the front of the case; many items appear discolored and aren't as chilled as those deeper into the case. 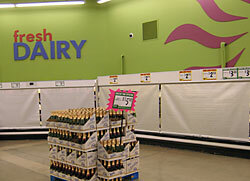 A refrigerated case full of products will show greater differences in temperature than an empty display case. Cold air does not flow as freely when blocked by stacks of food items within the case. In addition, the merchandise itself will hold the temperature of it surroundings; rear areas remain colder and the more exposed, open surfaces at the front of the case remain warmer. Typically, frequent compressor operation and a certain level of product discard is tolerated to ensure the customer can shop freely. Original equipment manufacturer, Hussmann Corporation offers their manufactured display cases to be fitted with Econofrost refrigeration covers as a solution to supermarkets as a means to reduce energy consumption, extend shelf life and maintain cold internal case and product temperatures longer. Econofrost night covers offer an efficient thermal barrier that retrofits to the opening of any display case. The night cover acts as an ideal thermal barrier arrangement and as an effective means of protecting perishable foods and protecting store profit margins. Econofrost night covers are a premium quality constructed night cover that offer chain stores and independent operators a quick pay back period and longest serviceable life for the greatest revenue savings. Very simple to install and easy to operate, Econofrost night covers do not interfere with customer access to fresh merchandise; they simply reward shoppers with a better quality selection for greater satisfaction. Give your customers the satisfaction of refreshingly chilled beverages, crisp fresh produce and mouth-watering packaged meat items! Request a quote for Econofrost night covers now!